Kim let me know about her lovely city prints from Albie Design. Of course the one of Seattle is my favorite, but there are many more cities in her shop and more to come soon! OMG Rachel, I just did an impulse buy of the SF print. HAHA So not like me, but I loved these prints! Thanks for link. Those are simply adorable. I would get one of Seattle too. Love it! I would love is she created Providence... Boston is close, but not quite! Adorable prints! i have to get the SF one! Are you from Seattle? Me too! Thank you, Rachel for including my work on your awesome blog!! YAY! BEND!!! I am so happy whenever anything from the Northwest is featured anywhere but WOW these are just adorable! And I am quite partial to the Bend print, since it is my hometown. Also love Seattle and Portland. BRILLIANT! I will be purchasing one soon! I love a good map print. And this one is no different. This is really cool! I like this idea a lot. Love it!! And I especially love that it is my hometown! I love this city print !! It's gorgeous ! What a great idea...maybe she'll move on to villages after cities? Love the whimsy. The color. Delightful. LOVE the portland one. anything of that city is my favorite. thanks for sharing them! I'm from Seattle too! 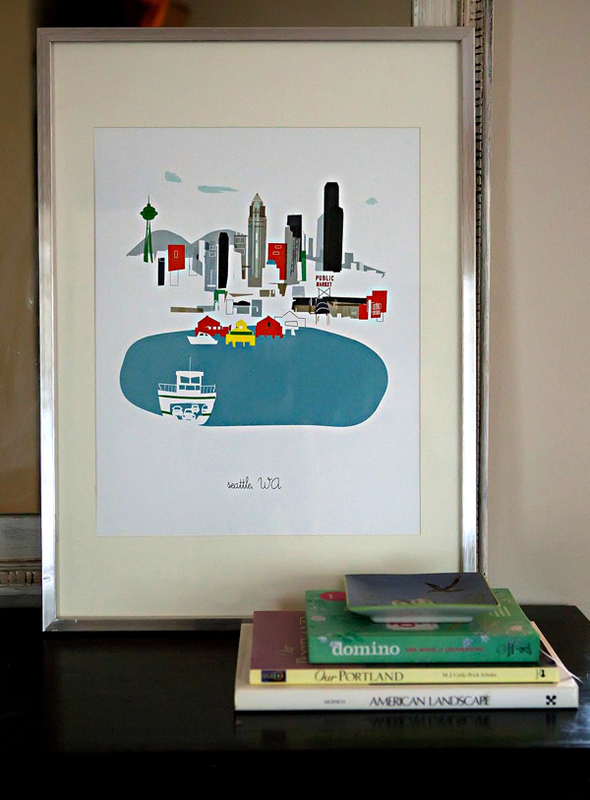 I love that the ferry is included in the print (reminds me of my summers taking the ferry over to Bainbridge Island). Gosh, I might have to impulse buy as well. Thanks again for all the kind words. I am working on a few new cities now, so I'll keep you posted. thank you so much for this post! i have been looking for an SF print for my yet to be born son's room and this on from albie design couldn't be more perfect! thank you!! I'm so excited!! As a Seattleite I've been waiting for this!